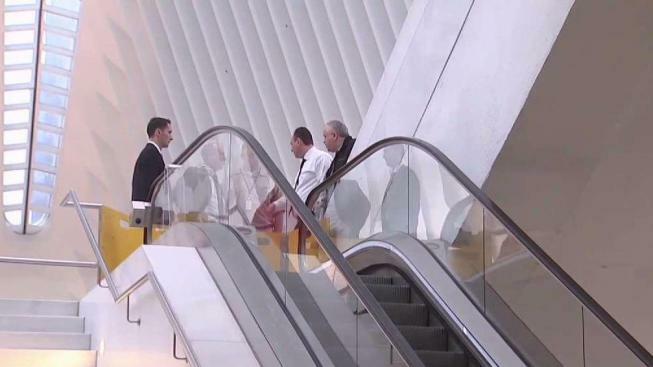 The stunning Oculus in Lower Manhattan has barely been open a year and already there are problems with the escalators. During the morning commute, stairs buckled, causing two men to fall. Rana Novini reports. Two people were hurt in an escalator malfunction at the World Trade Center transit hub in lower Manhattan Thursday morning, authorities say. Port Authority spokesman Steve Coleman says several stair treads on the escalator at the Oculus at Fulton and Greenwich streets buckled around 7 a.m. Two men were taken to a hospital for evaluation after reporting minor injuries; both were able to walk to a waiting ambulance, authorities said. Video from the scene shows the escalator blocked off as emergency crews and other officials stand nearby. Subway service was briefly affected. The same escalator was involved in a deadly fall in February, but that case did not involve an equipment malfunction. In that case, a 29-year-old woman plunged about 30 feet while trying to retrieve her twin sister's hat as the two rode the escalator. Officials said she stretched over the railing too far. Two people were hurt in an escalator malfunction at the World Trade Center transit hub, authorities say. The escalators are inspected every six months, as required by code, according to the Port Authority. The one that buckled Thursday was inspected two months ago, and it passed, officials said. It's not clear when the escalator will be restored.